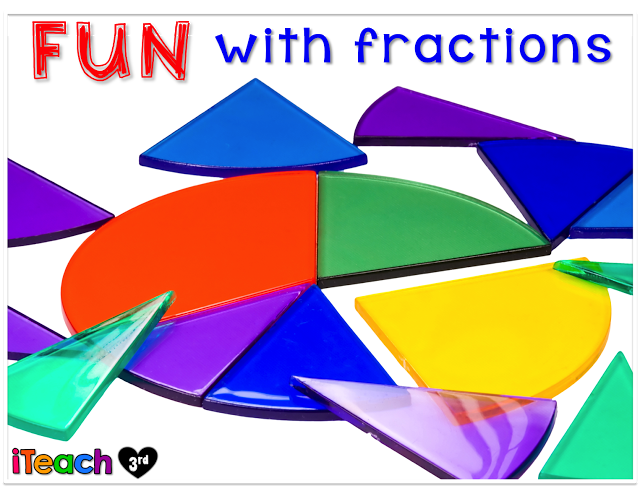 I’ve decided to focus this post on a topic that is extremely difficult for our 3rd-grade babies to understand… FRACTIONS! Besides elapsed time, year after year I find my students having a difficult time mastering fractions. 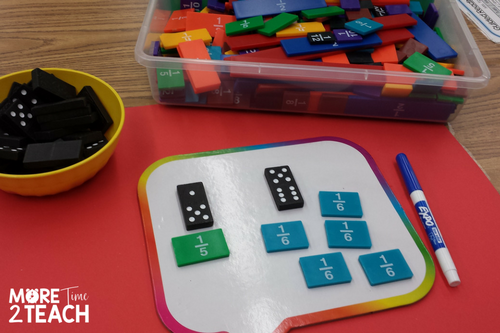 It’s also a topic that we need to make they understand because it is the foundation for future math concepts. In other words, if our kiddos leave us with a weak fraction foundation, they’ll be doomed forever… they’ll be forced to spend the rest of their lives without being able to share pizzas or brownies with friends You know I’m just kidding, LOL… BUT the truth is that without knowledge of fractions, students will NOT be able to do algebra or percents… So here are a few tips you can use to make fractions fun! 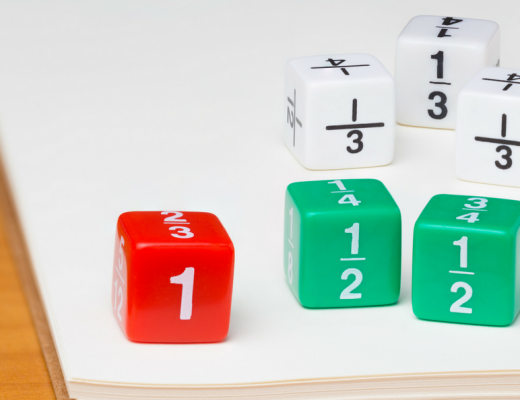 When teaching students about fractions it is important that we try to stay away from simply presenting them with a set of rules to follow. 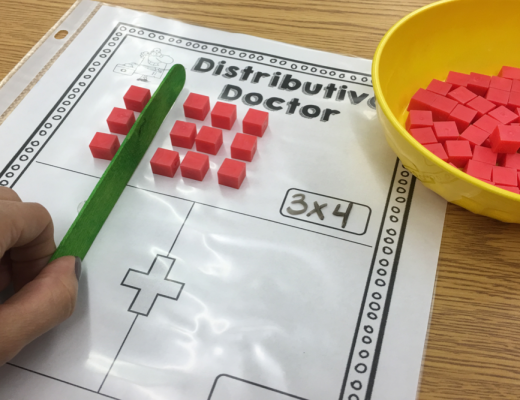 Try to stay away from teaching them “tricks” such as “if the denominator gets bigger, the pieces get smaller”. I know how hard this can be at times, trust me I’m guilty of it as well. 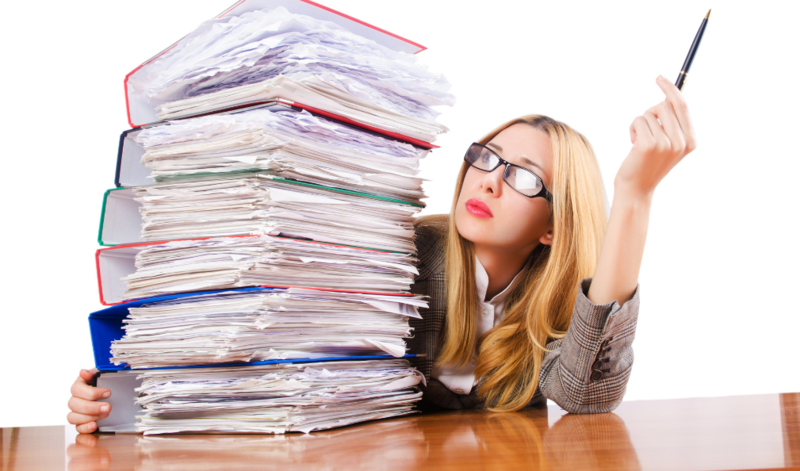 Especially when pressured to keep up with pacing guides or feeling rushed to cover a certain amount of material before testing time rolls around. All I’m saying is just try to teach them the concepts FIRST. You can always show them the tricks later. 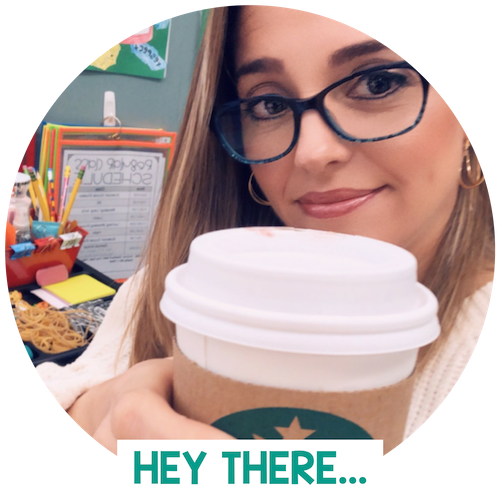 Remember that tricks are great in the short run, but if you’re thinking long-term (like when your kiddos leave your classroom) we need to make sure they know the concepts and NOT just the tricks. 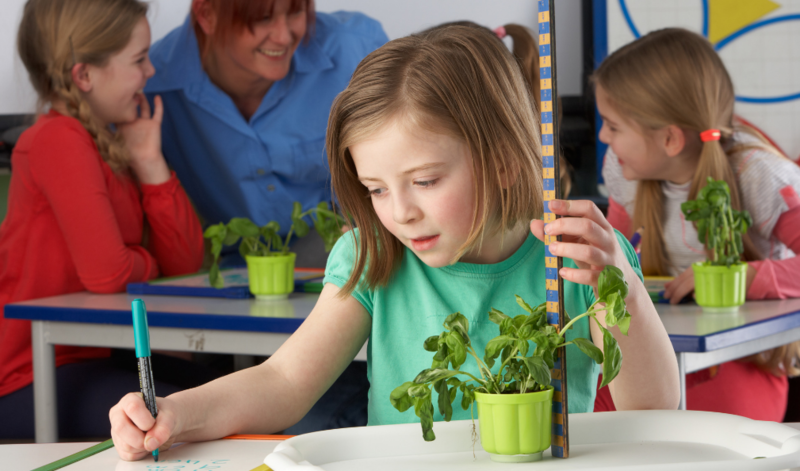 Before practicing with paper and pencil, students need to practice manipulating objects, shapes, and amounts. They need to explore a whole as being more than one. THEY NEED TO USE ALL KINDS OF MANIPULATIVES to explore fractions. It is also important for students to understand that NOT all fractions are created equal! This is actually one of the concepts that makes this topic complex. Not all 1/2’s represent the same quantity. 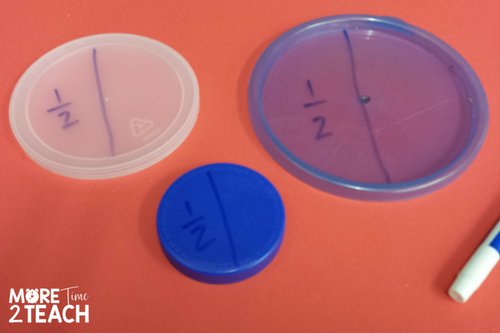 Take a look at the picture below where I had my students divide three different sized Tupperware lids in half using an Expo marker. This example clearly demonstrates that not all halves are the equal. It all depends on the size of the whole! 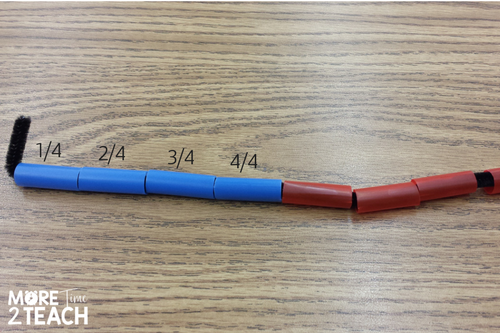 Students need to be exposed to solving various problems with fraction bars/strips. 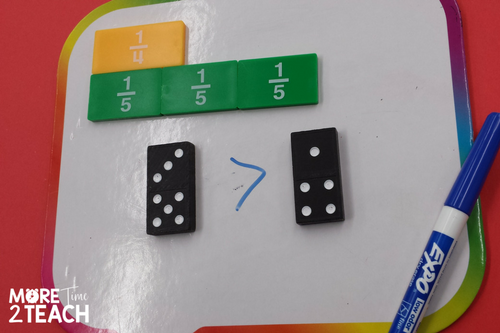 One of the activities I like to do with my class is to have students pick two dominoes that they will then convert into fractions. For example, in the picture below the domino on the left is used to represent 3/5 and the domino on the right shows 1/4. Students then line up the fractions bars and compare the two. 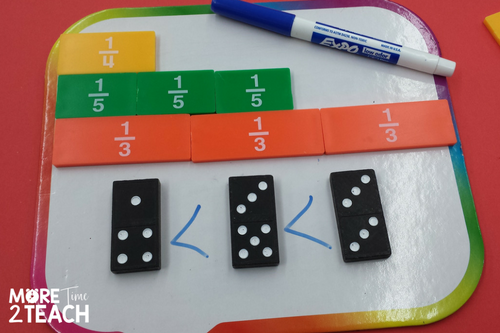 Allow students plenty of time to explore with fractions bars. Remember they need this time in order to gain a better understanding of fractions. Raquelle has to share her 15 pets with 3 friends. If each of her friends will get 1/3 of the pets, how many pets will each friend get? 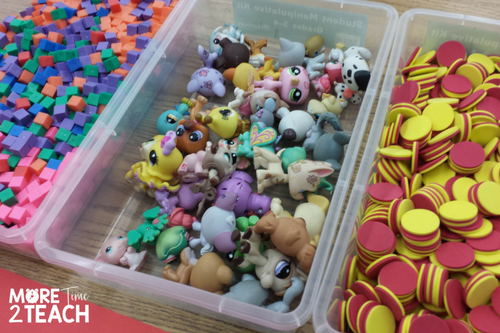 If you don’t have Little Pets no worries… counters, cubes, and even lima beans will work. I’ve used them all at one point or another. 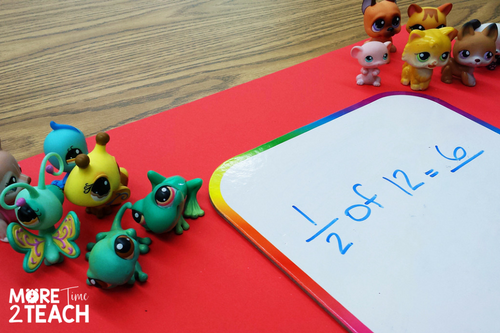 But I will tell you that these adorable little animals making learning about fractions so much more exciting for the kiddos! Don’t forget to show your students various forms of the same fraction. 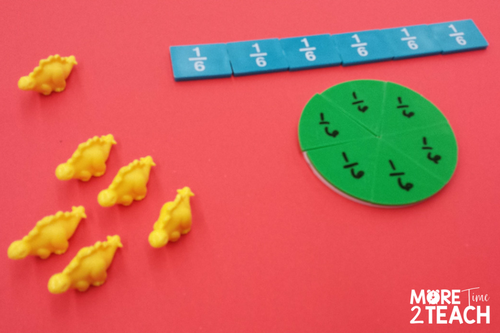 Expose them to fraction bars that show fractions as rectangles… show them fractions of a circle… show them fractions of a group such as the yellow dinosaurs below. You can even give your students a fraction and have THEM come up with as many different ways as possible to represent that fraction. Take your time when explaining fractions on a number line. This is one area where my students either seem to get it or tend to ride the #strugglebus. Because of this confusion, I decided to create a visual model that would allow my kiddos to manipulate segments on a number line. 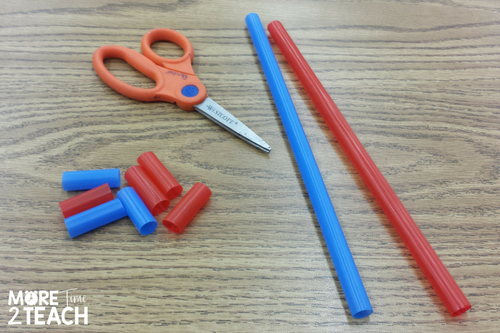 Using scissors, I had my students cut each colored straw in half. I then had them cut each half, in half again. This resulted in 4 red pieces and 4 blue pieces. Hence we had cut each straw into fourths. 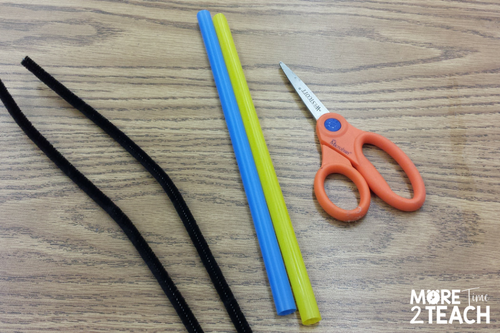 Next, I had my students thread the blue straw through the black pipe cleaner. We then practiced counting each segment… 1/4, 2/4, 3/4, 4/4 or 1 whole. 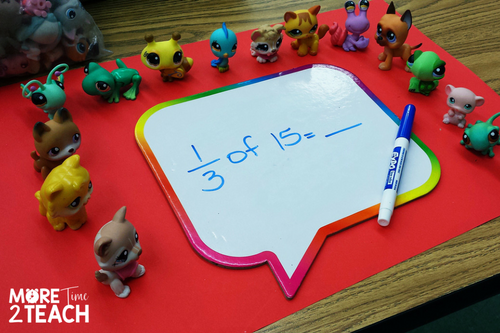 This activity can also be used to practice fractions greater than one… 5/4, 6/4, 7/4, 8/4 or 2 wholes. After seeing each straw broken up into segments, I found that my students were able to make the connections between the fractions and the number line. Some of them needed. We continued practicing and used our whiteboards to recreate each number line. We then practiced labeling them correctly. 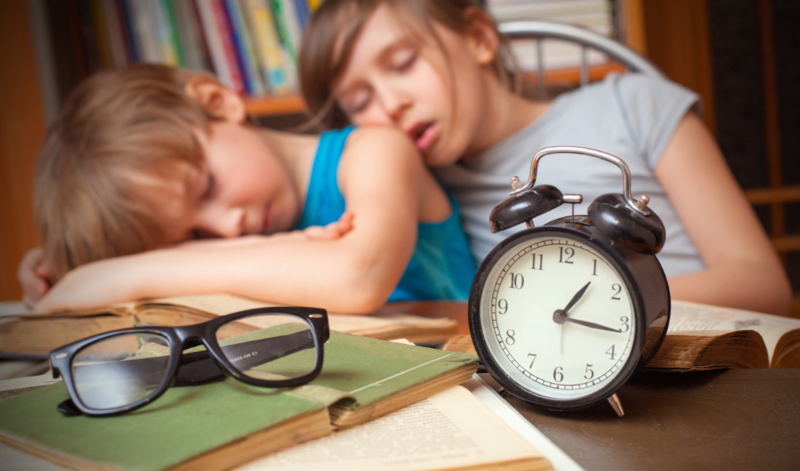 If you see that your students continue to struggle… don’t give up! Continue to practice. 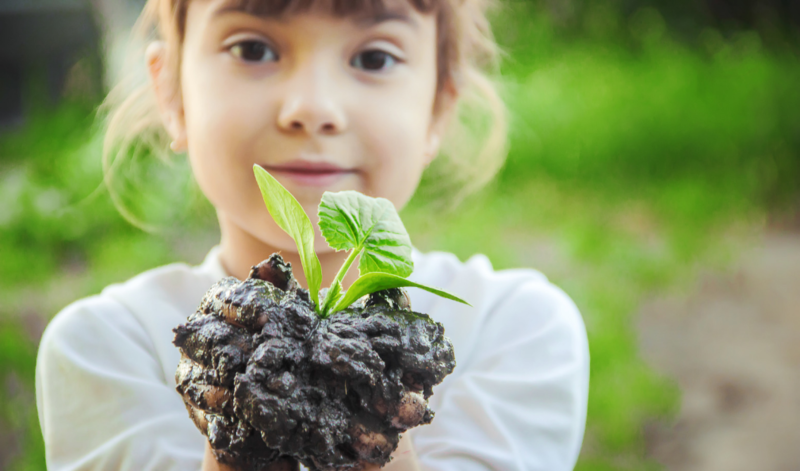 Remind them that fractions are something that they are going to need in the real world whenever they want to cook, when they need to measure something, or when they need to share something with their friends. This is certainly a topic that they will continue to see over and over again! 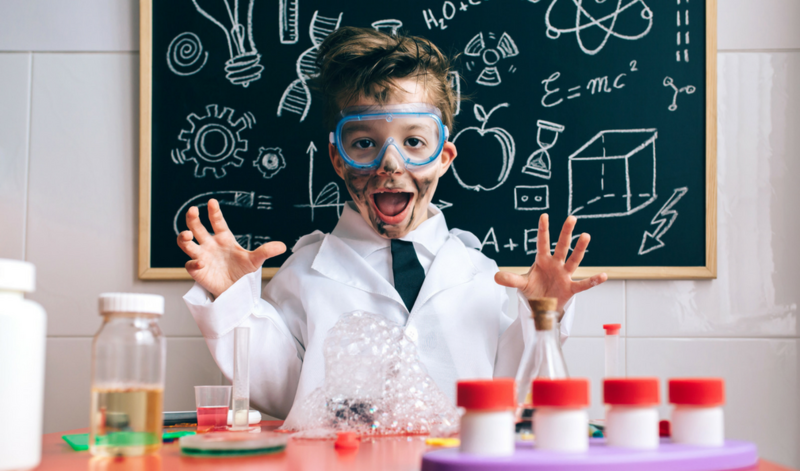 Do you have any great tips about how you make fractions fun in your class? If so, I’d love it if you’d share with me in the comments below! Click on the image below to pin for later!